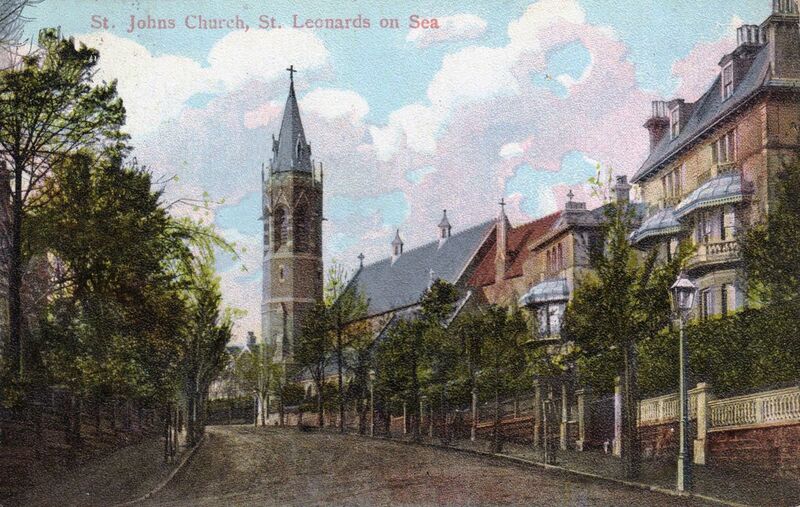 Though there was no church in the area before an offshoot of Christ Church, London Road (1 p5) was built in 1865, the present one is the fourth since then. Little is known of the first one, which was an iron one, built on a circular plan (1 p7). It was short-lived, for it blew down after barely a year. It is said to have been designed by S S Teulon (M Saunders in R Brown p224), but this must be regarded as doubtful, for though the plan was unusual, an iron church would hardly require the services of a well-known architect, even one of less than orthodox views like Teulon. The replacement, though small, was of brick and it is more likely that, if Teulon did anything here, this was his work (Alan Teulon (p43) implicitly shares this view by stating that Teulon’s church was destroyed by fire). This recalls the fate of the second church, which is said to have been damaged, as opposed to destroyed, by fire in 1878 (1 p4). Though enough remained for the nave to be re-opened in 1881 (CDK 1884 pt 2 p155), Sir A W Blomfield had already started the chancel of a more impressive church in 1880 (BN 38 p588). This was complete by 1881, after which a new nave was built round the patched up one and the church was consecrated in 1883 after £12,300 (KD 1899) had been spent. 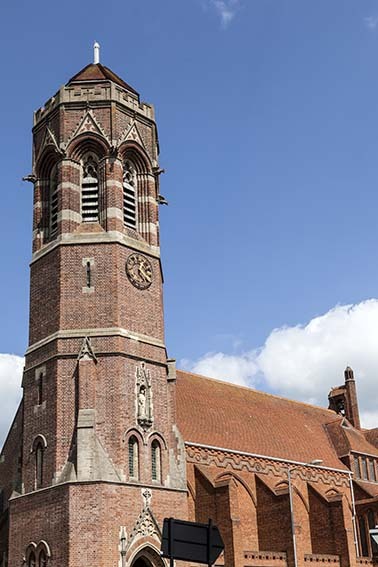 The material was brick in Blomfield’s later style, with big traceried lancets and an octagonal south west tower, which formerly had a spire with lucarnes. The west end has his favourite polygonal baptistery, projecting from a lower narthex. The nave arcades had five bays, a feature shared with other churches by Blomfield or his sons – see for example St John, Preston, Brighton. This church was bombed in 1943 and the surviving west end and tower were incorporated in a new one, built between 1951 and 1958 by H S Goodhart-Rendel (ICBS 60 Churches p21). 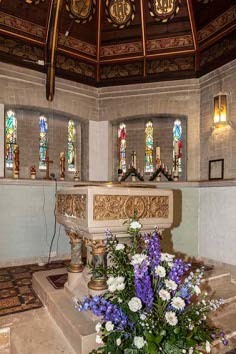 Blomfield’s plan, including the half bays in the nave, was retained, though the chancel was lengthened and a more stubby top was placed upon the tower. Brick was used again, some arranged in patterns of different colours, and deep buttresses above low aisles divide the sides. The effect is rather fortress-like, but more remarkable for 1951 is the way in which Goodhart-Rendel, a pioneer in the revival of interest in Victorian architecture, respects the previous church, especially at the east end, where his design derives from Blomfield’s frequently used device of multiple lancets in a single arch. The plastered interior departs more from its predecessor, with aisles which are for the most part little more than wall-passages and a chancel arch divided by a gallery. 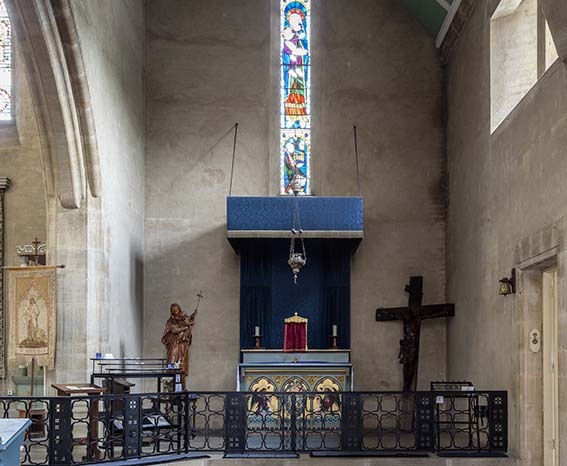 It has come into its own since a re-ordering in the late 1970s placed the main altar at the east end of the nave. Goodhart-Rendel planned niches with statues either side of the arch (1 p32) and it is perhaps no bad thing that they were never realised. Much detail is unexpected and enjoyable, like the transverse arches across the low transepts with lean-to roofs and south chapel or the free-standing shafts in the dormers between nave and chancel. 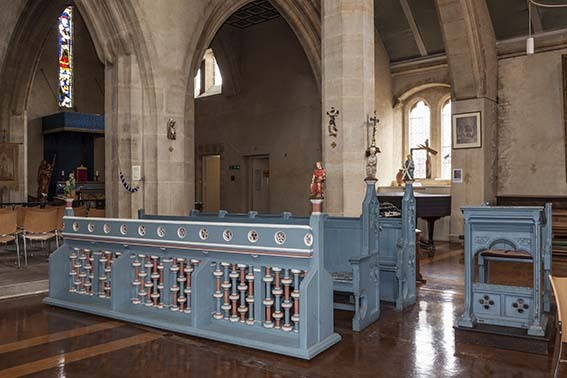 Some fittings were rescued from Blomfield’s church, including the choir stalls, and have been prettified with much blue paint in a way that is alien to their era; this is perhaps the only significant lapse on the architect’s part, always assuming he was responsible. Font: C19. Square on marble shafts – the carving has been gilded. 1. 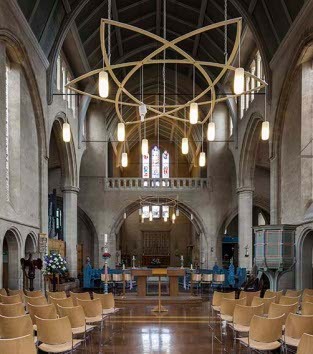 (Nave (including aisles and clerestory) and chancel) J Ledger (ibid p29), 1952 and made by Lowndes and Drury. In the tall nave lancets are single figures with larger scale compositions in the aisles and chancel. 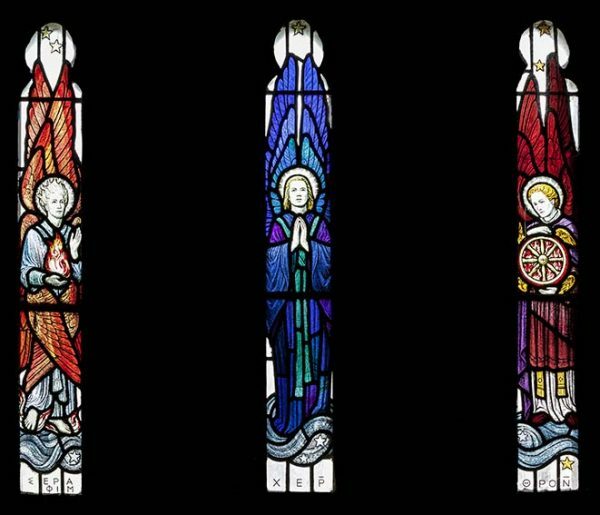 Some figures are of uncoloured glass. 2. (Baptistery) Nine lights by M G Thompson, also made by Lowndes and Drury, 1952-53 (DSGW 1958). Painting: (South chancel) Adoration of the Child by L’Ortolano (BE(E) p453) (C16 Ferrarese School), which hung over the altar of Blomfield’s church.